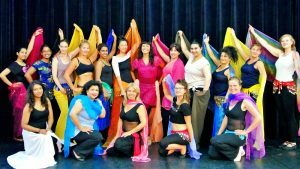 Would you like to join the Bellydance classes? dance actually is and if it would be something for you? welcome to sign up for a new course. can join classes of various levels, from beginner to advanced for adults as well as children. her 2 assistants Varsha and Natasha. aan het Spui in The Hague. Do you prefer to visit the website in English? Just click on the English flag in the menu.